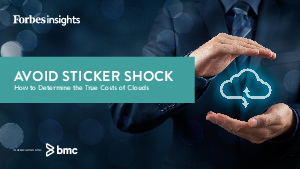 38% of enterprises have moved workloads from the public cloud back to their on-premise data centers- with costs being among the biggest concerns. It’s clear that enterprises need a framework for sorting through the complexities of cloud pricing models, which make it difficult to perform accurate comparisons of initial costs and to forecast spending over time. Fortunately, best practices and new tools for analyzing and monitoring IT cloud costs over time are helping IT and financial planners evaluate cloud and on-premise options to find the right balance of cost and performance.